I think this might be a new feature over the winter months! I'm back again with what I wore to work last week. These are the first 'selfies' with my new camera, a few focusing issues but already a massive improvement, as it seems to cope admirably with the low light levels on these dark mornings and represent colours much more accurately. It was also the first full week of my new haircut. I tried it in a ponytail on a few days, but I'm still feeling my way and trying to work out what I can do with it. I plumped up the fringe a bit too much on Thursday, it looks a bit 'Friar Tuck' in the photo!! I think this cut would look good tousled and backcombed a la Bardot, so will have to give that a try one day. Monday: Swing trousers, 20th Century Foxy. Heels, J Shoes (via TK Maxx), Top, Primark. Tuesday: Black dress, Zara (via car boot sale). Purple tights, M&S. 1950's repro court shoes, Clarks via Ebay. Wednesday: Navy shirt dress, H&M (via car boot sale). Boots, Jones the Bootmaker. Necklace, vintage Trifari (via charity shop). 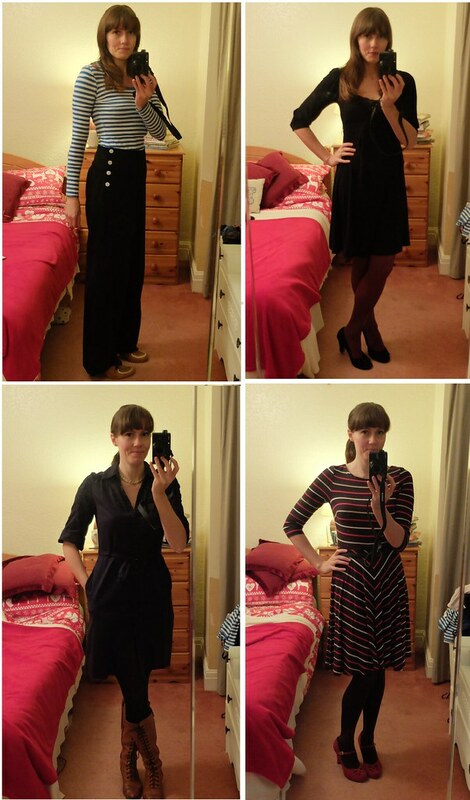 Thursday: Dress, Phase Eight. Shoes, Clarks. I'm looking forward to wearing some of my new charity-shop purchases over this coming week, and I should confess to having bought yet another pair of those 1940's style Clarks mary-janes off Ebay. That's the same shoe, in three different colours now, which may seem excessive, but I wear them all the time and they take me from work to parties. The perfect shoe. Do you have the same shoes in lots of different colours? Or do you like to wear completely different ones? I really should start buying multiple colors of shoes that I really like. That's a super sensible solution to "these shoes would be perfect with this, if only they were black/brown/blue/etc". Your nautically inspired outfit is so on point. I'm still loving your bangs. I'm still loving my hair too, though it does take a bit more work maintaining the style! You should definitely buy shoes you like in more colours, it's brilliant! Love both of the stripes outfits on you. You're so slim you can totally pull them off. I love that you love eBay! eBay is literally one of my favorite places to find great pieces for an affordable price! I always go to Ebay for never-worn shoes, which is something I never find in charity shops in my size. Great for affordable pieces, like you say! Lovely outfits and the new hair is fab. I have quite a few pairs of brogues in different colours another very versatile and useful shoe! I'm seriously loving the new fringe - in fact, you're making me wish I hadn't decided to grow mine out, because they're so perfect with that tousled beehive look! Mind you, mine always seemed to go the 'Friar Tuck' route, so maybe that's not such a great idea for me! I ADORE those trousers! Also your haircut is fabulous!